Funny, feisty, thoughtful and candid, the Kim Loo Sisters speak their minds in a documentary film that is both a vivid historical record and a moving memoir of a Chinese-American jazz vocal quartet popular in the first half of the 20th century. 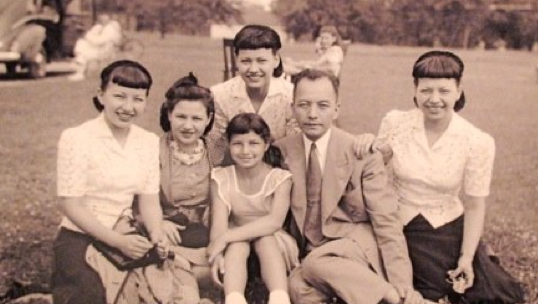 Daughters of a Chinese “paper son” and a Polish refugee, they overcame poverty and prejudice to perform first in kiddie revues in and around their hometown of Minneapolis, then on vaudeville circuits around the country, and finally on the Broadway stage and Hollywood screen. At a time when Chinese-American entertainers were a rarity, the Kim Loo Sisters shared top billing with such stars as Frank Sinatra, Jackie Gleason and Ann Miller. And though the prevalent media stereotype of Chinese women was either Dragon Lady (femme fatale), Suzie Wong (sexual plaything) or Madame Butterfly (submissive spouse/dutiful daughter), the four sisters personified not one but two all-American icons of the 40s — the girl next door and the pinup girl, albeit and improbably in Chinese dress. Are You Havin’ Any Fun? Later, three of them would trade their theater costumes for military fatigues when they joined the USO and shipped out with the fleet to entertain GIs stationed in Europe during World War II. The fourth would marry the son of the vice president of China and head to her father’s homeland — a divided China in the throes of revolution. Despite war and revolution, marriage and children, and long second careers far from the limelight, through thick and through thin, the four sisters have remained the closest of kin throughout their long lives. If anything, Kim Loo Sisters: Portrait in Four-Part Harmony is an homage to love and loyalty among siblings and what it means to be a sister among sisters. Composed of videotaped interviews of the four sisters conducted individually and collectively, and including a wealth of show business memorabilia, such as the “Kimmies” singing some of the top tunes of the day, this documentary encompasses more than the story of four biracial sisters whose roots are Chinese but whose reality is American. It acts as a prism shedding light on such defining — and controversial — issues as cultural identity, immigration, discrimination, race and gender.